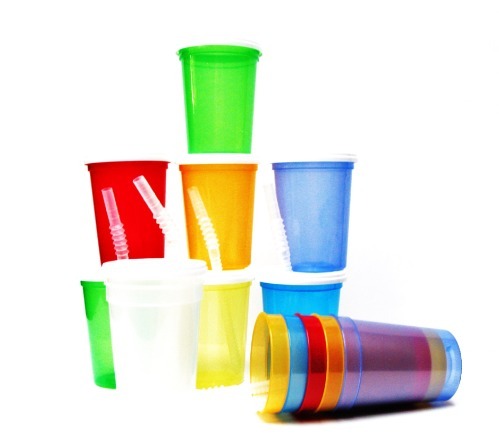 MADE IN THE USA OUR CUPS ARE LEAD FREE, CONTAIN NO BPA AND ARE RECYCLABLE. FREE SHIPPING!!! HANDLING 2 BUSINESS DAYS. DRINKING GLASSES ARE BRILLIANT IN A TRANSLUCENT COLOR, VERY DURABLE, DISHWASHER SAFE (TOP SHELF), TOP OF THE LINE IN QUALITY AND MICROWAVEABLE. THESE GLASSES HOLD APPROX. 12 OUNCES AND ARE GREAT FOR LITTLE HANDS. COLORS SHOWN: RED, CLEAR, BLUE, GREEN, YELLOW, PURPLE AND ORANGE. YOU WILL RECEIVE AN ASSORTMENT ALONG WITH LIDS AND STRAWS. WE DO SELL THESE IN ASSORTMENTS OF SOLID COLORS IN TRANSLUCENT OR OPAQUE COLORS IN OUR STORE AND WE WILL ALSO DO SPECIAL ORDER FOR YOU ON QUANTITIES AND COLORS. CALL OUR TOLL FREE NUMBER. QUESTIONS OR REQUEST ON QUANTITIES, COLORS OR SILKSCREENING CALL US TOLL FREE AT 1-877-275-0052.